You’d think that Kenneth Branagh, an actor so synonymous with the work of William Shakespeare as either an actor or a director, would have already played the Bard himself at some point in his career, but it comes as a shock that All Is True, in which he both directs and stars, is the very first time that he has inhabited the legendary playwright responsible for all the material that he’s adapted over the years. It could not be a more perfect pairing of actor and icon, but Branagh’s film is significantly less exciting than said pairing promises; in fact, the movie is a rather dull affair that never lifts off the ground as much as it really should, especially with the talent involved in making this. As mentioned before, Branagh both directs the film and stars as a more solemn Shakespeare, who in 1613 returns to his home in Stratford after the Globe Theatre burns to the ground during a performance of his play Henry VIII. There, he is given a bit of a cold welcome by his older wife Anne Hathaway (Judi Dench) and his two grown daughters – Susannah (Lydia Wilson) who is wed to a strict Puritan, and Judith (Kathryn Wilder) who is unmarried and deeply self-loathing – who resent him for his virtual abandonment of them whilst in London, and for not being there for the death of his admired young son Hamnet. Whilst taking refuge at the large country home they reside in, Shakespeare attempts to make amends with his family before his own time comes. You can understand why Branagh was so attracted to Ben Elton’s script for this (other than the desire to actually play Shakespeare), as it is this sort of self-reflective movie that grounds the lauded playwright as deep in the soil as the flowers Shakespeare is shown to plant in a garden he makes throughout the film. The film touches upon a few instances during Shakespeare’s later life, but by and large the focus seems to primarily be on his attempts to fix the strained relationship with his family; a noble approach for a subject matter that comes with a lot of baggage, and it’s a far cry from more theatrical and more Hollywood fare like Shakespeare in Love. It’s also, as you would expect from a master actor like Branagh, very well-acted, with the film’s maestro really sinking his soul into this character and giving a very soulful and emotional performance that really humanises the legendary scribe; Judi Dench doesn’t have quite as much to do outside of staring stoically into space but the moments that require her to bring her A-game do work, and Ian McKellen as the visiting Earl of Southampton – who despite prominent billing in the film’s trailer is really just an prolonged cameo – probably has some of the most effective moments in the film, the majority of which come from a surprising extended conversation between him and Shakespeare, which touch upon certain rumours about the two of them. However, as noble as the intentions may have been, the overall impact of this film is about as limp and dreary as an exceptionally old flower stalk; this is the kind of film where nothing ever really happens, and continues to not happen for the vast majority of the movie, which given that this is about one of the greatest writers of all time should perhaps have a little more going on than this. Again, I get that the intention was to present a more stripped-back biopic, but All Is True falls into the same trap that A Quiet Passion fell into, where nothing would happen but there was also nothing interesting to keep you invested in what was going on, which turns the film into something of a tiresome bore. For almost the entirety of this movie, you’re really just watching endless conversations between characters, often not even saying anything of particular interest, and whenever something interesting does tend to actually happen – for example, someone makes a public accusation that Shakespeare’s daughter Susannah has been unfaithful, and so the family sues for libel – it’s immediately resolved within minutes, at which point the film retreats back into being an endless conversation piece. Some of these scenes are also shot very weird, kind of like we should be watching this on a stage instead of in a movie; you can sense that the blocking and overall framing of a shot is meant to be a lot more like a stage production, which again you could argue was Branagh’s intention to shoot it like this, but film has very different rules to theatre so here it just looks really off-putting and distracting from the scene’s overall impact. I’m genuinely surprised that the film didn’t turn out to be very good, because the ingredients for it to work are right there; a Shakespearian actor and director actually getting the opportunity to play Shakespeare himself, and casting other Shakespearian actors like Judi Dench and Ian McKellen, in a story intended as a humanising portrait of the legendary writer, and with a heavy emphasis on the themes of family and death. Yet, the final product feels rushed, unengaging, and like a giant wasted opportunity, which must be a huge bummer for Branagh as this was clearly a passion project for him, but unfortunately it didn’t turn out the way he had probably intended. If you’re a Branagh/Shakespeare completist, then you’ll probably want to check it out; as for everyone else, you’re probably going to be too bored to really care all that much for it. 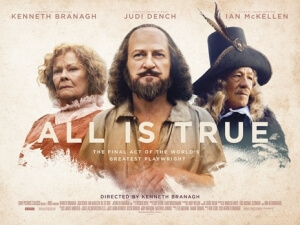 All Is True has noble intentions, and some stellar performances including from director Kenneth Branagh, but ultimately this tale of Shakespeare in his later years is largely dull and never takes off as much as it really should.